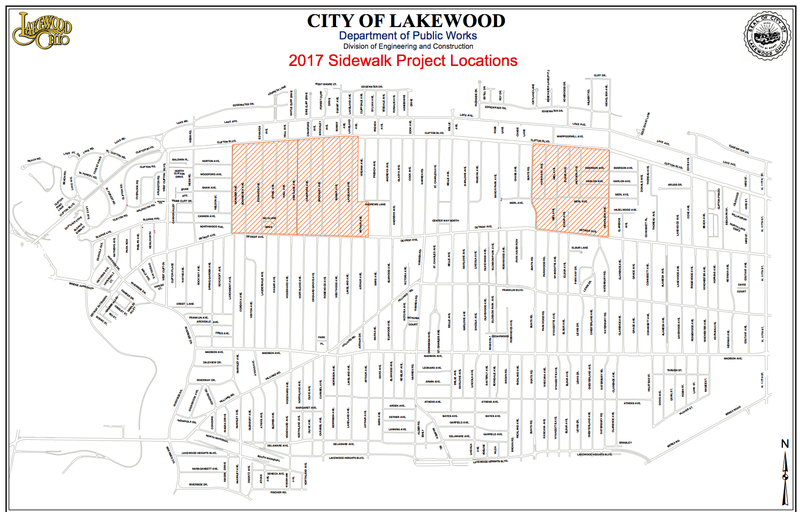 The city of Lakewood is entering its fifth phase of a 10-year strategy to improve the city’s 180 miles of sidewalks and keep them among the most pedestrian-friendly in the state. This year, the city is focusing on three main sections in Lakewood: 20, 12, 4, all from Detroit to Clifton. See the attached map for those detailed sections in Lakewood. In the fall of 2016, approximately 1,000 properties were inspected. Residents with trip hazards will fall into one of two categories: Grinding the seams of the sidewalk (at $34 per seem); replaced (approximately $7 per square foot). Residents have some options. They can pay to have the sidewalk fixed themselves (after obtaining a permit) or participate in a citywide bid with the city’s contractor — the idea being to lower the price for property owners. Property owners with identified sidewalk issues will receive a mailed letter from the city. The fifth phase of the 10-year plan runs from May through November. The city is using a map that divides the city into 30 sections, and plans to inspect three sections — or 10 percent — each year. For this year’s phase, the city will pay for sidewalks damaged by the trees in the tree lawns. Have a look at the attached map to see if your street is getting an inspection. For more about the city’s sidewalk strategy, click here.